We’d love your help. Let us know what’s wrong with this preview of The Writer's Digest Guide to Query Letters by Wendy Burt-Thomas. Anyone who's researched the marketplace knows: The path to publication begins with your query letter. If your query is weak, unfocused, or uninspired, an editor or agent won't even bother to request your article, novel manuscript, or nonfiction book proposal. But a well-crafted, compelling query sent to the right editor or agent is an essential sales tool for fiction writers and the most effective way for nonfiction writers to pre-sell your idea. 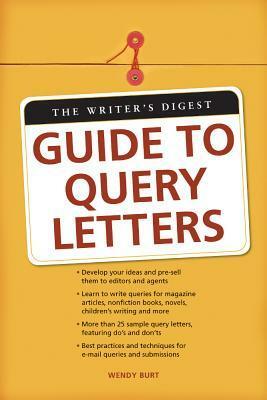 To ask other readers questions about The Writer's Digest Guide to Query Letters, please sign up. You'd think there wouldn't be 200 pages worth of material to writing a query letter, but you'd be wrong. This book is straightforward, practical, and on topic all the way through. It's more focused on articles and nonfiction, I'd say, so perhaps it's not the best book for fiction queries; but for nonfiction, it's pretty stellar. What was particularly useful to me were the numerous examples, both good and bad. It's clear that the author has query letters down to a science, and she's not just pushi You'd think there wouldn't be 200 pages worth of material to writing a query letter, but you'd be wrong. This book is straightforward, practical, and on topic all the way through. It's more focused on articles and nonfiction, I'd say, so perhaps it's not the best book for fiction queries; but for nonfiction, it's pretty stellar. What was particularly useful to me were the numerous examples, both good and bad. It's clear that the author has query letters down to a science, and she's not just pushing a simple recipe. Good read. I wish it would have focused a little more on queries for fiction as opposed to all the magazine info. But there were still things from that I think are applicable to book world. I think tis one is going to be helpful. Liked this and learned a lot of useful stuff. This is my favorite kind of "how to" book, the kind with a lot of different samples. (Many authors and agents only give a couple of examples, usually their own or their clients.) So this one has the advantage of covering a wide range. There's some helpful info here, but more than half the book wasn't applicable to me. The info for novelists is good, though. If you know nothing about queries, pick this up. If you already have a decent understanding of queries, you can skip it. Great book for anyone wanting to dabble into freelance writing. Filled with details, sample cover and query letters, what if scenarios and tons of resources. The writing is very light and funny but straight to the point. very practical and a very nice read. All I can say is if your planing on being a writer, you need this book. The tips in this book made me take a hard look at my writing and sat me on the right path.